Bassnectar shared another bootleg from his extensive collection of nearly finished / not yet finished tracks, a kind of mash-up of different music stylee. More downtempo and 'electric' than his usual bass party killers. I would say not bad at all, at all. 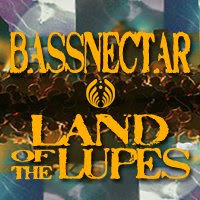 I love Lupe Fiasco's "kick push" and I love to sing along with this song (though really, me singing is the last thing you would like to hear) while listening to it and driving my car, hereby the Bassnectar's Land of the Lupes gets my seal of approval. Go grab it peeps. It's nothing big but definitely a nice, melancholic track. Lorin hirself says: “I took the beat of a long-overdue unreleased tune called “Stretch Reflex” and melted it together with the synths and melodies from another song that was supposed to be on Underground Communication, but ended up getting saved for later. It was written as a pensive homage to the dead, the original melodics sound like a black metal song but in this version they have kind of a nice 1990’s Orb or FSOL feel to them…that sound will never get old for me! Then i took some of the prettier melodies from that song and mixed them with a Lupe Fiasco acapella (i looooove his voice) and it became one of my favorite tunes to close a party with.